The Milwaukee® M18™ Jobsite Radio/Charger is the first charging radio to bring the power of Bluetooth® to the jobsite, while delivering the industry's best reception and sound. The most advanced radio of its kind, the M18™ Jobsite Radio/Charger features a Bluetooth® receiver so you can stream rich, full sound wirelessly from over 100 feet away. Its unique battery charger allows you to charge any M18™ battery without sacrificing reception or sound quality. For added versatility, a high-power USB port allows you to charge most portable electronic devices over 50% faster than any competitor. The M18™ Radio/Charger's lightweight, high-strength design includes a reinforced roll cage for protection from weather and abusive jobsite conditions. The radio/charger also offers the industry's largest on-board, weather-sealed storage compartment to protect your small belongings and smart phones. A 16" auxiliary input cord and 2 AAA batteries are included. 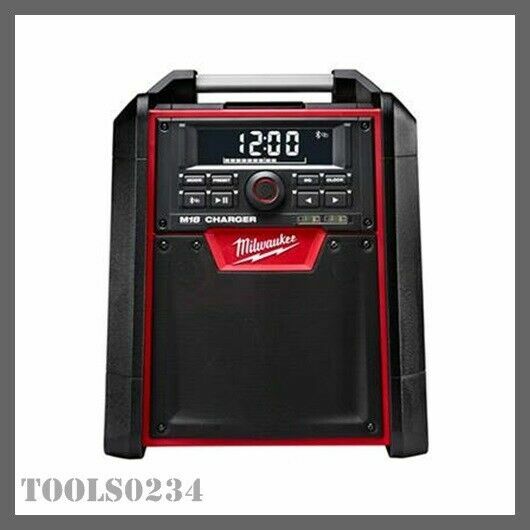 Get tunes, new and more on the job site with this M18 Jobsite Radio/Charger from Milwaukee. It has a convenient built-in charger for quick, convenient charging of all M18 batteries, along with an exclusive digital Bluetooth® receiver that streams audio wirelessly from more than 100' away. The premium speakers and 40-watt amplifier produce a rich, full sound. Plus, it has a handy on-board bottle opener for added versatility. Returns will be accepted if buyer orders in error/wrong size. Used, broken or damaged tools or components are not returnable. Returned items must be new, unused in original package. Buyer pays return shipping. We always address issues and concerns immediately and to the best of our ability. E-MAIL US! Here at AIS in Denver we sell only quality tools at affordable prices!! We have lots of stuff!! 2) Shipping: Charges calculated by Ebay. We ship by Fedex and USPS within stated handling time to confirmed addresses only. All international shipping handled by Ebay’s global shipping program. Multiple purchases will be combined where possible. 3) Inventory: We list only what we have. If we are sold out we will notify immediately and issue a refund if necessary. 4) Returns: See return policy posted on each listing. In general we do accept returns unless otherwise stated. Our absolute return limit is 30 days. 5) Warranties: Most hand tools fully covered by manufacturer unless otherwise stated. Power tools covered by individual manufacturer’s warranty and usually honored at a service center in your area. 6) Communications: We try to answer all inquiries promptly. Please ask all questions prior to any purchase. If there is a problem let us know right away. We will do our best to fix it. 7) Feedback: Feedback is automatically left for buyers when payment is received. Items purchased on Fridays after 6AM Pacific Time will be shipped the following Monday.